In this particular method, I use plums instead of more commonly used prune because I prefer sweet-sour over sweet; and I also add saffron at the very end to take away the dark and add to the richness of taste and aroma. Beef or veal, defated, washed and cut into cubes, 400 gr. Spinach, washed, dried and coarsely cut, 600gr. Start by a trick I want to tell you about! Wash and drain spinach in a colander and sprinkle with about 1 teaspoon of salt before cutting them. This way, the spinach will absorb the salt and will be tastier once cooked in your stew. The next steps are pretty much the same as in most of other Iranian khoresht. In a pot, sauté onion in 1-2 tbsp. of warm oil over medium heat until slightly golden. Add meat and fry with onions for 5-6 minutes, or until the meat’s color changes. Add turmeric and continue frying another minutes. Cover with 2-3 glasses of hot water, add salt and pepper and cook over medium heat with closed lid. Once the meat is half-way cooked, add the plums. Note that you would want identifiable plums in your serving dish; they should not be over cooked. So, depending on the type and brand of the plums you use they may need to be added earlier or later; you be the judge! In a large frying pan heat 1 tbsp. oil and sauté spinach until you get a dark green spinach. Add them to the pot and simmer for at least 30 minutes, so the stew is “settled” and all tastes are well mixed. 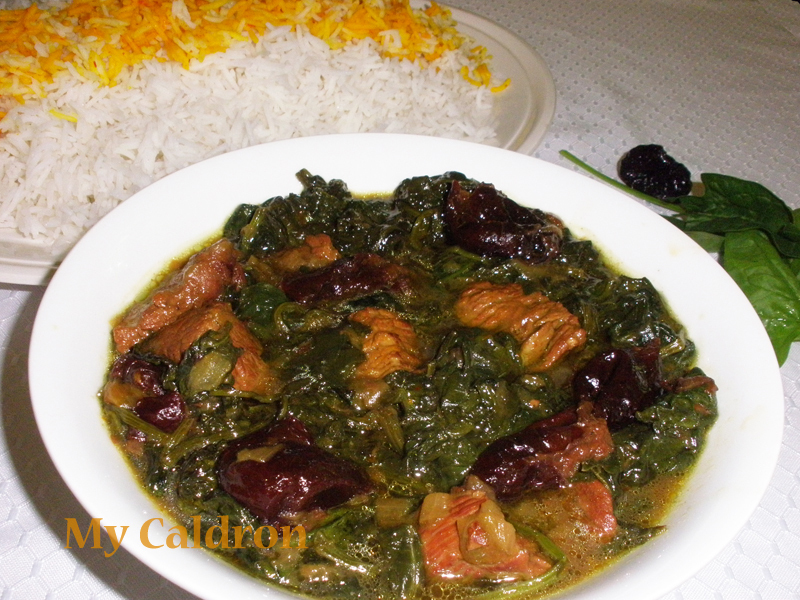 Three minutes before serving, add half of the diluted saffron, plus lemon juice to the pot. Taste for adjustment. Serve hot with plain rice, chelow, as lunch or dinner. The remaining diluted saffron is to be mixed with one scoop of cooked plain white rice and sprinkled on top of rice platter. You will love this, especially if you like spinach. Bon Appétit!